Storage Instruction: Keep in a cool dry place. Ingredients: Water (91%), Sugar, Grapefruit Juice Concentrate (0.05%), Honey (0.03%), Food Additives (Citric Acid (E330), Sodium Carboxymethylcellulose (E466), Sodium Citrate (E331), Vitamin C, Beta Carotene), Edible Essence. 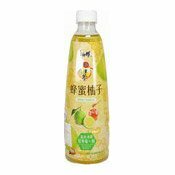 Simply enter your details below and we will send you an e-mail when “Honey & Pomelo Juice Drink (康師傅柚子蜜)” is back in stock!